Analysis of the behaviour of the FTSE100 Index for very large one-day falls. 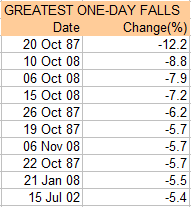 Since 1984 there have been 189 very large one-day falls, where “very large fall” is defined as a move more than two standard deviations beyond the average daily change in the index. In other words, a very large fall is any decrease over -2.19%. The following chart plots just these very large one-day falls. As can be seen, although the greatest fall was in 1987, the frequency of these large falls is higher in recent years. 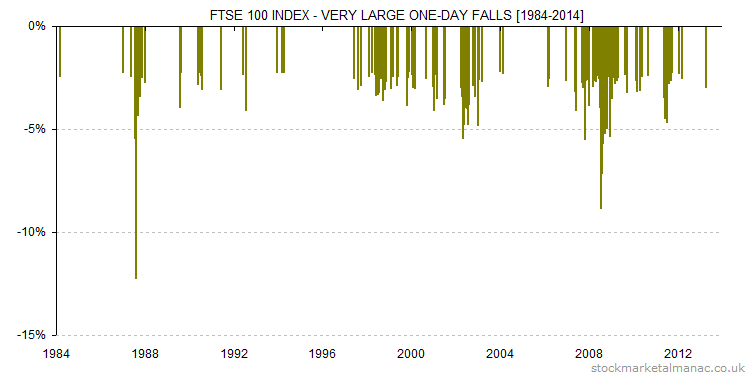 The following table shows the ten largest one-day falls in the FTSE 100 Index since 1984. 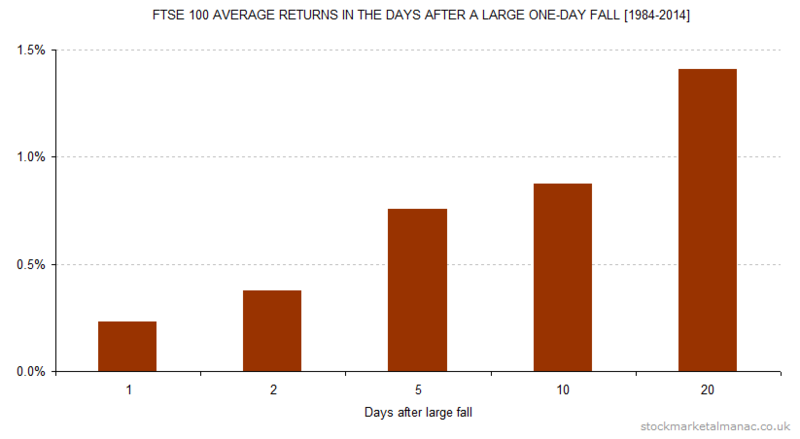 The following chart shows how on average the index behaves in the days following a very large fall. The Y-axis is the percentage move from the close of the index on the day of the large fall. For example, by day 5 the index has risen 0.8% above the index close on the day of the large fall. As can be seen, the index rises steadily in the days following a very large fall, and by the 20th day the market had rebounded 1.4% from the close of the day of the large fall. Other articles on large one-day moves. 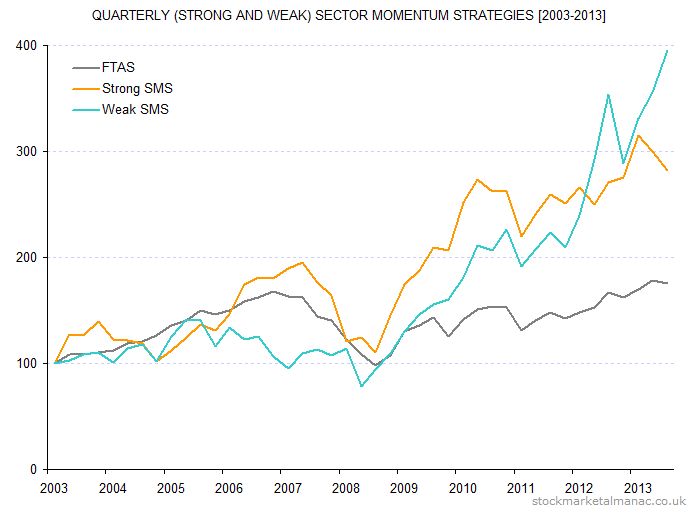 Do FTSE 350 sectors display a quarterly reversal behaviour that can be exploited? In a recent article we looked at a momentum strategy that aimed to exploit the price momentum of strong sectors from one quarter to the next. This article looks at whether there is a reversal behaviour, i.e. where poor performing sectors in one quarter bounceback the following quarter. The following chart shows the performance of a portfolio that each quarter is fully invested in one FTSE 350 sector, that being the worst performing sector of the previous quarter. Elsewhere, the portfolio is similar to that of the previous momentum portfolio: at the end of each quarter, the portfolio is liquidated and a 100% holding established in the weakest sector of the quarter just finished. This is held for three months, when the portfolio is re-balanced again. Each year there will therefore be four re-balancings. Only FTSE 350 sectors with at least three component companies are considered. The period studied was from 2003 to the first quarter 2014. In the chart below the reversal portfolio (Weak SMS) is plotted against the FT All Share Index (FTAS) and also the previous momentum portfolio (Strong SMS) for comparison. The three series are re-based to start at 100. As can be seen, the reversal strategy under-performed for the first few years and then out-performed. 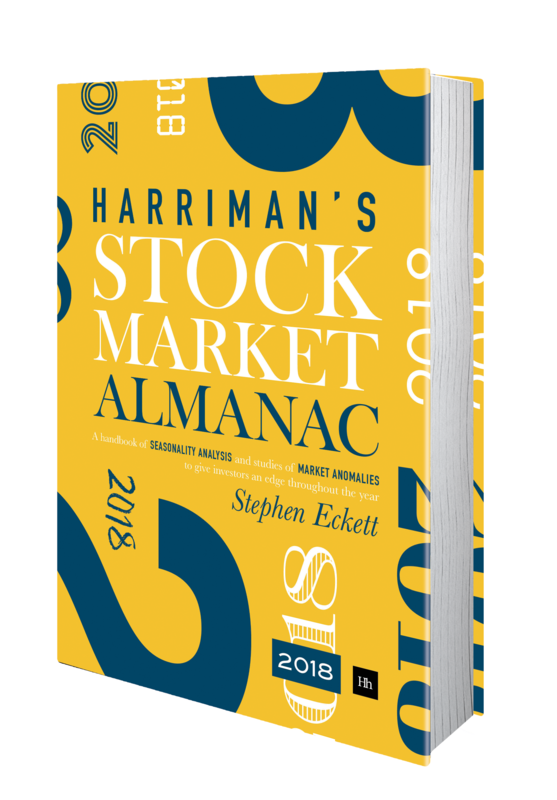 The volatility of the portfolio’s quarterly returns (standard deviation of 0.13) was higher than that of either the momentum portfolio (0.12) or the FTSE All Share Index (0.07). A refinement of the strategy would be to hold the two or three worst performing sectors from the previous quarter instead of just the one (which would likely have the effect of reducing volatility). Costs were not taken into account in the study. But given that the portfolio was only traded four times a year, costs would not have had a significant impact on the overall picture.